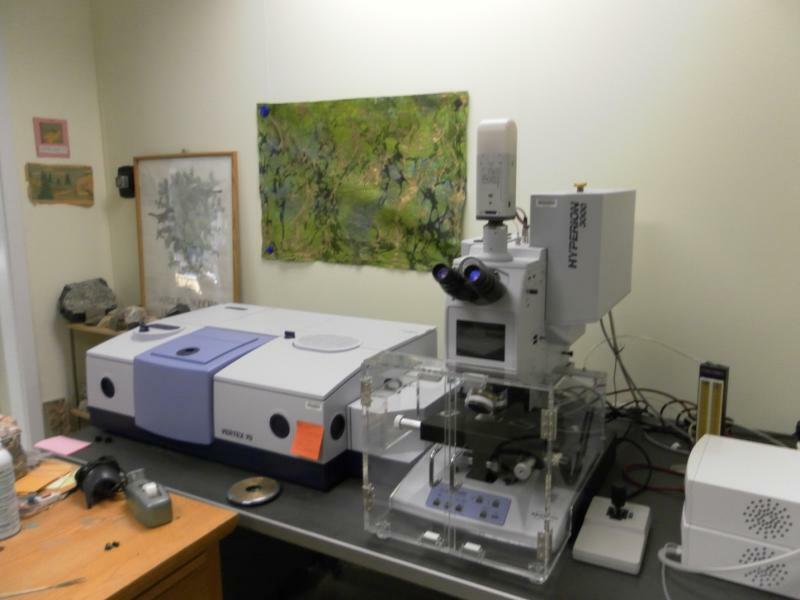 The Fourier transform infrared (FTIR) spectroscopy laboratory is equipped with a Bruker Vertex 70 spectrometer and a Hyperion 3000 IR microscope. Analyses can be done in reflected or transmitted modes in the mid to near IR range. The instrument has both a mercury cadmium telluride (MCT) detector for collection of spectra from single spots on samples and a focal plane array detector (an array of 4096 detectors, each collecting information from a 2.8 x2.8-micron area) with which maps of compounds of interest can be collected. We also have a Praying Mantis diffuse reflectance accessory in which analysis of powders are conducted (most recently to measure biogenic silica in lake sediments). The system is purged with nitrogen gas and the microscope stage area is enclosed in a plexiglass shield to further mitigate atmospheric contamination. The instrument has been used to measure water and carbon dioxide concentrations in volcanic glasses (both melt inclusions and groundmass glass), and in minerals, to correlate the occurrence of water with strain features in minerals, and to measure biogenic silica in lake sediment samples, among other applications. Sample preparation for quantitative analyses of water and/or carbon dioxide in volcanic glasses and minerals in rocks involves highly polishing a sample, cementing it to a glass slide using acetone-soluble epoxy, grinding it to approximately 100 microns thickness, and applying a high polish to the second side of the sample. The sample is then soaked in acetone to remove it from the glass slide. We welcome outside users to the laboratory, but generally ask that sample preparation be done at the user’s home institution, or by a sample preparation service. Please contact Sheila Seaman at sjs@geo.umass.edu for rates and availability of machine time. eruption in Iceland, with a map of water concentration is shown below. 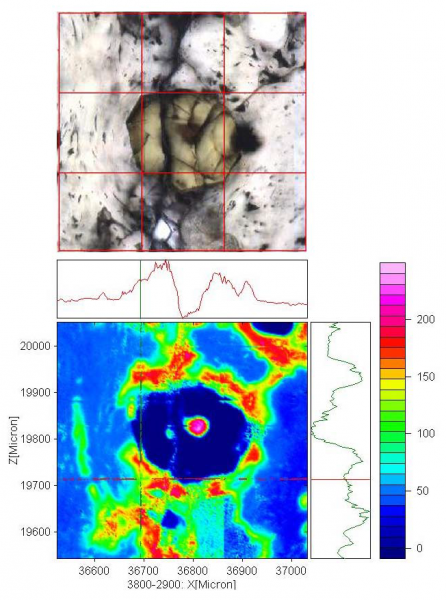 Note the melt inclusion inside the pyroxene crystal.